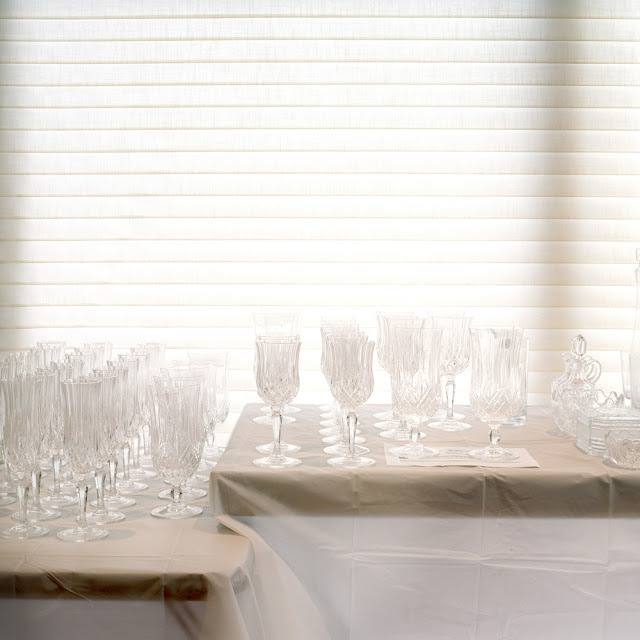 fototazo: The Image: Erika Ritzel, "Normandale Court, Stillwater, MN (Crystal Glasses)"
The Image: Erika Ritzel, "Normandale Court, Stillwater, MN (Crystal Glasses)"
Erika Ritzel: This photograph was actually the first one I made in the series. I had just contacted an estate sale company and they were sweet enough to let me stop by and photograph on the last day of the sale. This photograph is one of my favorites in the project because of how simple it is. The blinds created this really soft light. The glasses had a big folded price tag on them that I removed for the picture because I felt it was distracting. It always amazes me when I go to these sales how much glassware people own. There is usually multiple tables setup full of clear glass. I feel like I have taken a similar picture multiple times at different sales.